We left our car at Kayak Africa’s office this morning and paddled with our guide Mauri about two hours out to Dombwe Island. Corlene showed us around “his” island and informed us that we’d be the only clients there that night. We had lunch and afterward did some swimming and snorkeling. Our “Tent” is the size of a normal hotel room with a double bed, two chairs, and a table. 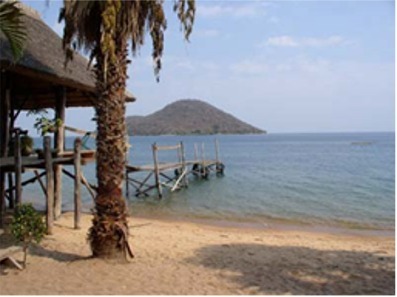 It’s on a platform covered by a thatched roof overlooking the lake with a hammock out front. It’s absolute heaven and exactly what we hoped for our anniversary. The food is excellent and the staff attentive without being overbearing. The toilets are waterless and eco-friendly and the showers have a view of the lake. At about 430 we got back in our boat and paddled along the shore of the island. We saw some fish eagles hunting and some fishermen in Mkoros. We arrived back at camp just as the sun set, casting a golden hue over the still waters. After a shower we sat in the dining room and talked until our dinner was served. Its great having a staff of three to look after just the two of us! We both slept wonderfully last night, with the breezes coming through the tent. 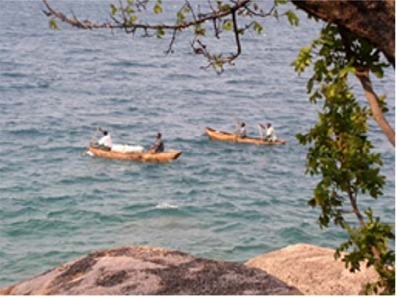 As we ate breakfast, a strong wind was blowing from the south and we watched as a lone fisherman in a Mkoro struggled against the wind to make about 100m in 45 minutes, then loose half of that as he bailed water out of his canoe. We are planning to paddle 8km to the north-east this morning, which means we will be across, then with the wind. Unfortunately the waves will be hitting us broadside. Mauri, who paddled out from the mainland this morning, set off with us. It took us about three hours to make the crossing. The waves weren’t as bad as we expected, but it was still rather exciting. Mumbo is even more beautiful than Dombwe. 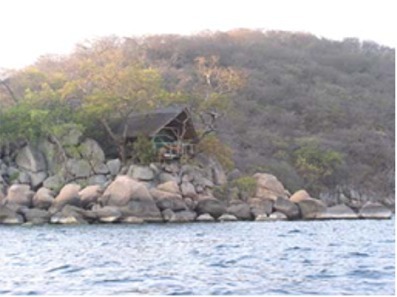 The kitchen is on the main island, while the dining room and guests tents are on a smaller island connected by a short footbridge. We settled into our tent, and relaxed before lunch. 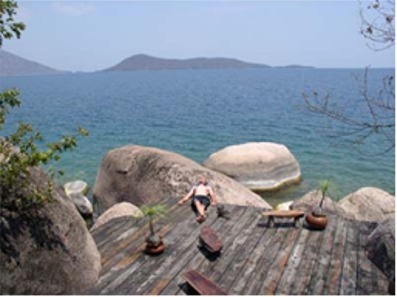 There are two honeymooning couples staying on Dombwe, and we would learn later that this has been voted the third best honeymoon spot in Africa. In the afternoon we went scuba diving, which was similar to the diving farther north at Kande beach. We spent the remainder of the day relaxing, enjoying the peace and relaxation, and another wonderful meal. We're trying to figure out how to fit a setup like this on the landy. Planning to leave after lunch for the 10km paddle back to the mainland, we did some hiking in the morning. We went to a rocky beach on the lee side of the island where we enjoyed swimming in the sheltered waters. After lunch the wind still hadn’t subsided, and we didn’t fancy a 10km paddle into the wind. We radioed the base, and they agreed to send a boat to fetch us later in the afternoon. We enjoyed a beautiful sunset from the boat on the way back. We spent some time talking to the managers. Apparently the owners set it up as a sea kayaking shop, but now most people just go out by boat just to enjoy the islands. The owners are currently on a more hard-core trip on the Mozambican coast of the lake with some clients. We went back to Fat Monkey’s and back to our “real” budget. We left Cape McClear this morning, and after picking up our car model (packed in a wicker basket for protection, which they were happy to throw in for an extra 5 bucks) we headed south for Liwonde National Park. We’re hoping to see some sables there, a species of large antelope we haven’t seen before. The distances in Malawi are wonderfully short and we arrived there by lunch time. We met two Dutch doctors, Hans and Paul (Hans lives in Malawi) driving a Landcruiser and spent time talking with them. It turns out that Hans ran into David and Nadine in Blantyre a couple of months ago! We got to talking about Land Rovers and it turns out that Paul is an amateur mechanic. I asked him if he would look at my steering shudder problem. He took a look and couldn’t see anything wrong, but suggested a mis-balanced tire. It occurred to me then that the problem started after having a tire repaired in Lusaka. It was done by a proper shop, and the guy told me he had balanced it, but that doesn’t mean he did it right. We booked a boat trip on the Shire river in the afternoon, and got to see some elephants as they fed in the fading light.